Blindfold on, Snoop! Snoop Dogg and Martha Stewart have a trust-building moment during Martha & Snoop’s Potluck Dinner Party’s midseason premiere, as seen in Us Weekly’s exclusive sneak peek. The dynamic duo’s cooking show returns Monday, February 13, and the hilarious preview clip features the pair cracking jokes and making sushi with guests Kathy Griffin and Mike Epps. “The things that white people make me do,” Snoop jokes as he ties a blindfold around his head. Stewart, 75, rolls some fish into the rice and says, “The blindfold will make for a more sensual experience." Because who doesn&apos;t want their dinner party to get as sensual as possible? 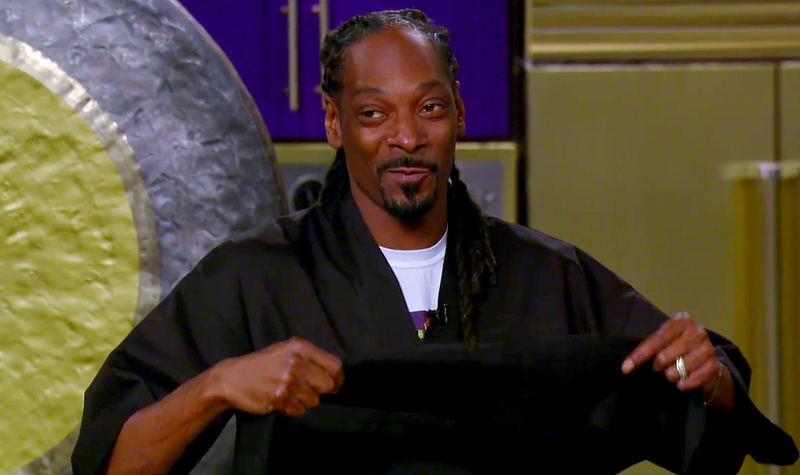 She then goes in to feed Snoop a bite of the slimy sushi ball, and Epps quickly quips, “Snoop! She about to put her t–ty in your mouth." This causes the "Gin and Juice" performer to jump back, alarmed. But the treat might not have been as delectable as Snoop was expecting. “It was amazing, Martha! That tastes so good, I don’t think I could have another bite!” he fibs after spitting the creation into a napkin. The unlikely duo, who appeared together on a Super Bowl ad that aired during the big game Sunday, February 5, have been friends for years before teaming for the show that features them hosting dinner parties with their celebrity friends. Watch the footage above to see the exclusive sneak peek of the VH1 series, and tune in to Martha & Snoop’s Potluck Dinner Party’s midseason premiere, Monday, February 13, at 9 p.m. ET.